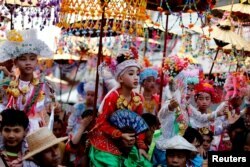 The festival is held each year in the mountain town of Mae Hong Son. It ends with a parade in which the boys - some as young as seven - are carried through town on their fathers' shoulders. They are dressed in brightly colored clothes and highly detailed headpieces. Some villagers join the parade. They dance, beat drums and play other instruments. The celebration is part of an ancient ceremony that ends with the boys becoming novice Buddhist monks. The boys belong to the Shan ethnic group, which lives mainly in Shan state in neighboring Myanmar. The group also spreads into parts of Thailand, China and Laos. About 50 boys take part in the festival. It is split into different parts during a one-week period. It takes place just before the traditional Thai New Year in April, during which most villagers are home and children are on a break from school. First, the boys have all their hair cut off. Their bodies are washed in flower-scented water. Then, they are dressed in white and have colorful designs drawn on their faces. The makeup is thought to have protective qualities. At this point, the boys are considered to have reached a partly divine state. They are not permitted to touch the ground or walk by themselves until the festival is over. The process is seen as bringing honor to the boys’ families. Many parents must save money for a long time to pay for costs related to the ceremony. Most families also accept donations from other family members and friends. Kasen Kongtui is a Thai trader. He supported one of the boys, 12-year-old Poo Sit. The boy is a family friend. After becoming novice monks, the boys live and study at Buddhist temples for a few months during school holidays. August is an 8-year-old boy who completed the ceremony. He spoke to Reuters about his favorite part. “I liked having my head shaved,” he said. He was dressed all in red and gold, with a large hat holding fresh pink flowers. Bryan Lynn adapted this story for VOA Learning English, based on a report from Reuters. Ashley Thompson was the editor. merit making – n. a Buddhist practice in which people perform regular good deeds in order to increase spirituality and become happier in life.